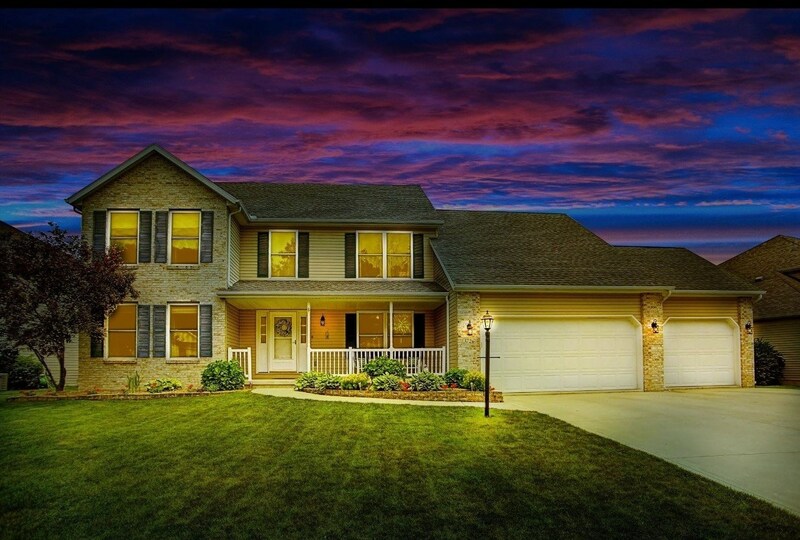 Stop in and see this captivating 2-story home in New Haven! Tucked away in Ashford Lakes with a pond view, this amazing home offers 5 bedrooms, 3 full baths, 2 half baths, and over 3600 sq. ft. to make your own! It has a finished basement too! You will love the openness of the home and all the large rooms. Lots of bright, natural light shines in all the windows throughout. There is new desirable flooring in many areas of the home including the kitchen, laundry room, and baths upstairs. Enjoy holiday meals and family gatherings in the formal dining room. It flows nicely into the spacious living room with a beautiful eye-catching brick fireplace. Head into the eat-in kitchen which features an abundance of cabinetry, lots of counter space, and a striking backsplash making this space really pop! You can work from home in the den/office or turn it into whatever your heart desires. There is the convenience of 2 master bedrooms with one on the main floor and the other upstairs. Both are spacious in size and have nice walk-in closets. Upstairs you will find 3 more perfectly sized bedrooms and another full bath. The separate laundry room is on the main floor and has lots of cabinets for storage and there is a half bath on main floor as well. Downstairs in the finished basement you will enjoy a huge open area great for a rec/media room, playroom, workout space, etc. There is also a half bath in the basement and a closet under the stairs for extra storage. Travel out back and entertain family and friends on the new concrete patio while you host cookouts and bonfires in the built-in fire pit. There is a new beautiful pergola with an attached bar and seating area. You can easily enjoy sunsets while relaxing on the patio or pergola! The entire back yard is fenced in giving off a nice sense of privacy and is great for kids and pets to run and play. This home has a 3-car garage and a radon mitigation system. Situated in a great family friendly neighborhood with many amenities and great curb appeal, this home is just waiting for you to make it yours today!